What Day Of The Week Was April 29, 2011? 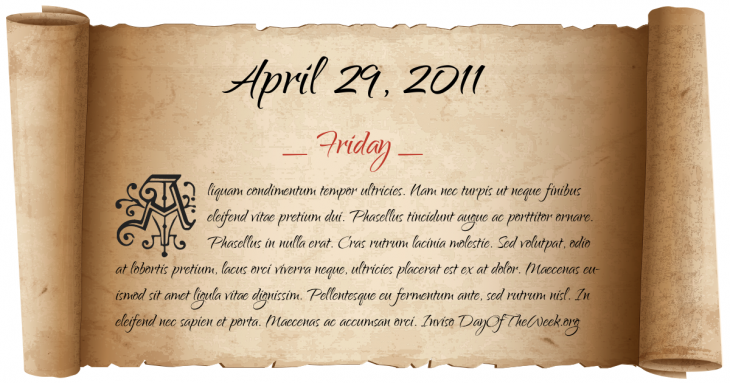 April 29, 2011 was the 119th day of the year 2011 in the Gregorian calendar. There were 246 days remaining until the end of the year. The day of the week was Friday. Here’s the April 2011 calendar. You can also browse the full year monthly 2011 calendar. Wedding of Prince William, Duke of Cambridge and Kate Middleton.